Plot Summary: When an earthquake drops Makoto Mizuhara into a cave underneath his school, he finds ancient glyphs and a pretty girl, who sends him, his teacher Mr. Fujisawa, and two classmates Nanami and Jinnai (brother and sister) to an alternate universe. 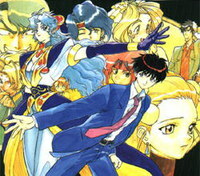 Jinnai becomes the leader of the Bugrom, an enemy force trying to take over the kingdom of Roshtaria, while Makoto, Nanami, and Mr. Fujisawa ally themselves with the princess Rune Venus of Roshtaria and the three priestesses of fire, wind, and water. Jinnai, in need of a weapon against the kingdom, seeks out the demon god Ifurita, hidden under Floristica, the Roshtarian capitol. Ifurita is the same girl who sent Makoto and the others to El Hazard originally. The fight for both Ifurita and the kingdom ensues. #3. Guilty or Not Guilty?